In one of the least serious, but most fun, events of the season, fans at the Oxford Plains Speedway (ME) got to see a little bit of racing action between SPEED Channel personality and Speed51.com founder Bob Dillner and defending PASS champion Johnny Clark Wednesday night. 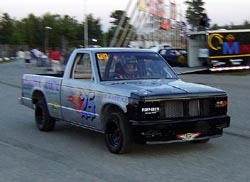 The two drivers piled into Sport Trucks at the facility for a special match race. Even Cassius Clark was impressed with Dillner’s driving…or was he? "He might be able to compete with what I saw tonight,” said Ryan. But maybe not in one of the headlining Super Late Models/Pro Stocks for the 250 weekend. Keep in mind that the Strictly Stocks and Mini Stocks also run on 250 weekend as support races. “Yeah, that might be more appropriate,” said Ryan. But Ryan was fair in his joking. He also got one on Johnny Clark. Before the race, Dillner and Clark had made a pact that the loser would have to dive into a swimming pool set up in the infield. Since it wasn’t clear who was the winner or loser, both drivers took a swim in their firesuits. For good measure, they also picked up PASS driver Cassius Clark, a spectator, and threw him in. Clark fought and scrapped to avoid it, but had no luck and was floating in the pool before too long. “I fought it to the end,” said Cassius. “We had to include him because he looked funny sitting there all dry,” said Johnny Clark. “I think our fans loved it and really loved seeing those guys swim,” said Ryan. With the 250 falling on an off Cup weekend, might that open the door for Dillner to return to the track and race someday? Dillner gets ready to dive in the pool. With one of the country’s largest short track races in the country, the TD Banknorth Oxford 250, coming up next week, was there anything that Cassius Clark could learn by watching the match race? Probably not. It got a little ugly, in a playful way, after the race as well. 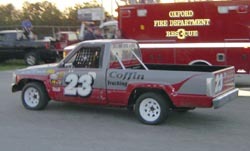 The regular 20-lap Sport Truck feature event was on the docket before the match race. 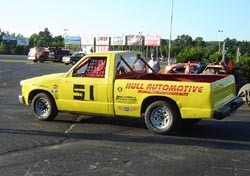 Dillner took the wheel of the #51 truck for that event and started at the rear of the 16-truck field. 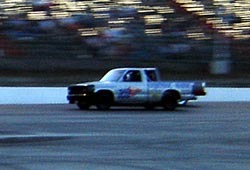 Two-thirds of the race through, Dillner was at the tailgate of the fifth-place truck. At that point, the truck started to lose power and three laps from the end the engine expired. Dillner coasted to the infield and was credited with an eighth place finish. This created a bit of a problem. Clark and Dillner were ready to race, but only one truck was in condition to do so. That problem was solved when the winner of the second feature, Chris Martin, graciously agreed to lend his #23 Toyota truck to Dillner. But that created another problem. The 6’, 5” Dillner could not fit into the #23 truck. Instead, he squeezed himself into Jay Hull’s #25 Chevrolet and Clark took the reins of Martin’s #23 Toyota. Now the race was ready. At the start, Clark jumped to an early lead as Dillner took a lap or two to get up to speed. Dillner had to start the race in a higher gear since his long legs could not get to the clutch pedal and that slowed him down at the start. Once going, Dillner caught Clark and the two swapped the lead several times. Dillner stayed out front for awhile, and then it was Clark’s turn. On the final lap, Clark was running high with Dillner low and they literally crossed the finish line side-by-side. The race was so close, that no winner could be determined. The two drivers did gain a boatload of respect for each other though. “I got schooled by Johnny Clark,” said Dillner. “That’s why he’s the PASS champion and that’s why he’s going to the Gong Show for Roush Racing. Dillner and Clark were neck and neck for most fo the race. Then again, Ryan is very aware that Johnny Clark might get the last laugh. The winner’s share of the 250 purse is $25,000 and a driver gets $100 for each lap led. Last season, Clark led the most laps in the 250 before getting sidelined by a lapped car. This year, he might just walk away with a good share of Ryan’s money. And this week, he walked away with the trophy. Track officials gave up on trying determining a winner after the close race and gave Dillner and Clark both a trophy for their efforts. Click here for more photos from the Oxford Match race.